Jacob's Dream is lesson 9 in the first quarter of a year of Preschool Bible Study that I assist with on Wednesday evening. Last week we talked about Isaac and Rebekah. They had twin boys named Esau and Jacob. Esau liked to be outdoors and hunting. Jacob liked to stay in the tent. 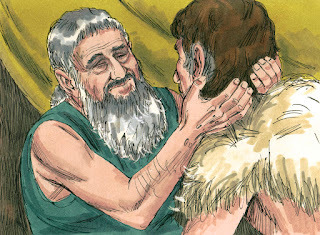 Rebekah put fur on Jacob and he took the meat to Isaac. Jacob tricked Isaac and was given the birthright (inheritance). Jacob left home because Esau was so angry. There are two parts of the Bible. 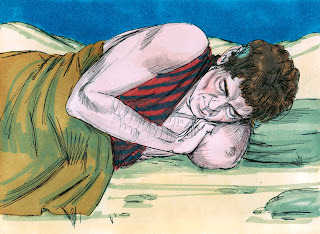 We are learning about people in the book of Genesis (28-29). Genesis is the first book of the Old Testament. After Jacob left home, he decided to stop when it was dark. He used a stone that was there for a pillow. And, that’s where Jacob laid down to sleep. When Jacob woke up early the next morning, he said surely God is in this place and I didn’t even know it! Jacob took the stone that he had used as a pillow and stood it up like a pillar. He poured oil on the top of the stone. Jacob called the place Bethel which means ‘House of God’. Jacob continued on his journey. He came to Haran where his Uncle Laban lived. Jacob stayed with Laban for a long time. Jacob got married and had 12 sons. One of them is Joseph. We will learn about Joseph the next couple of weeks. For the review project, I created this one page printable in color and black & white. 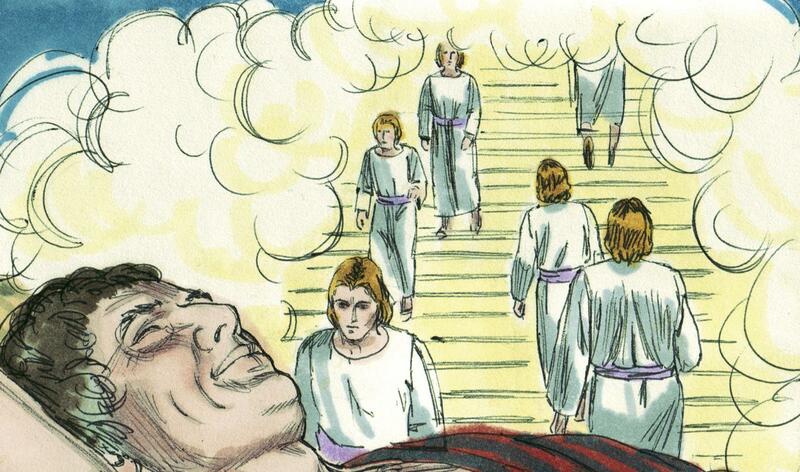 Make a slit on the ladder to insert the angels strip. Add some star stickers and glue cotton on the clouds and it's done! Move the strip from the back to make the angels move up and down the ladder. Click here to download. I set up this Tri-Fold (science) board for a visual. These are great for a big visual, easy to store and easy to make. The kids love them! Click here to see it. **Well, I totally changed this lesson when I was preparing to teach it! Because of the students we have, I deleted the last part of last week's lesson. We didn't talk about Jacob tricking Isaac and Esau. So, I had to change the beginning of this week's lesson. I am having to simplify them. So, if you want to see it, you can download the alternate lesson here, which I ended up liking better anyway. 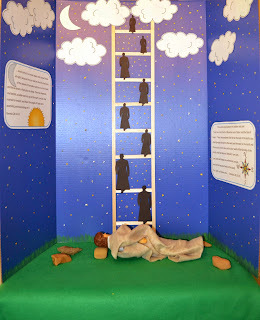 Click here to see the lesson and printables for Jacob's ladder for early elementary ages.